In honor of Valentine’s Day, Dove Key Ranch Wildlife Rehabilitation’s animal of the month is a member of the crane family. Honored as symbols of marital fidelity and conjugal bliss throughout Southeast Asia, the native cultures of India, and Japan (where it is customary to adorn wedding gifts with folded origami cranes in place of ribbons and bows), gruids have a celebrated reputation for monogamy in folklore as well as in scientific investigations. 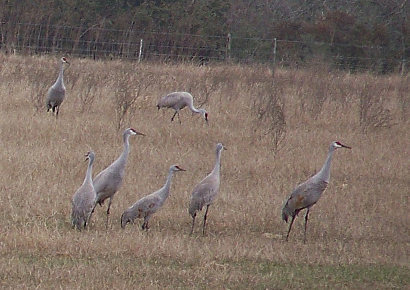 The sandhill cranes pictured above are members of a wintering flock approximating 50 individuals that ply the neighboring cattle field for seeds, berries, and small creatures throughout the coldest days of our Texas winters. Necks outstretched and lanky legs trailing behind, flocks of Lesser, Greater, and Canadian sandhill cranes populate high-flying v’s and ride the thermals in whirlwinds, heralding the Texas autumn with their distinctive trumpeting calls. Projected from one of the longest windpipes in the avian world, these bugles can be heard for up to one mile away. Every November, nearly 500,000 sandhill cranes drop like leggy parachutes into the rice fields, open wetlands, pastures, and native prairies that comprise their winter abodes throughout Texas, Arizona, New Mexico, and Mexico. Their 4 ft high figures are dressed in bustles of gray feathers, some dyed a rusty hue from the iron rich mud of more northerly marshes. Adults are crowned with a red-skinned cap that can be glimpsed darting in and out of vegetative clumps, from which sandhills glean their mainstays of berries, grains, insects, green shoots, and small vertebrate life. Migration is a family affair for these stately birds. One to two chicks mature under the protective guidance of both parents for nine to ten months, wheeling with mom and dad from nesting grounds dotting the tundra, wetlands, and grasslands of the northern U.S., Canada, Alaska, and Siberia to warmer larders in the southwest. Contributing to the stability of the family unit is a usually monogamous partnership between the mated adults, one that may endure a lifetime of up to twenty-five years. Couples cement their reproductive unity each spring with elaborate courtship dances. Reminiscent of cajoling ballerinas, the bonding pair betray a powerful elegance as they alight: leaping, strutting, bill-raising, and gracefully fluttering their majestic wings, the soundtrack provided by their own rolling calls. Touted as avian bastions of marital fidelity, cranes slip out of these shrouds of anthropomorphism when loyalty would exact a high evolutionary cost: illness or death of a mate or loss of a year’s brood often initiates re-coupling. "Luckily for present-day Texans, the migratory flock of sandhills stock the largest concentration of cranes on the planet!" As the warmer winds of March blow across Texas, the cranes turn their sights and wings to the north, bonds between parents and the former summer’s young dissolve, and the winter haunts of these trumpeting avians fall eerily quiet. This a comparatively recent silence, however. Majestic sandhill cranes once stalked their way through the wetlands of coastal Texas year round, coo-ing to newly hatched offspring nestled in mounds of marsh vegetation. Non-migratory populations of these prolific gruids stretched across the southeastern U.S. and Cuba, steadily fragmenting and disappearing under the burden of over hunting and habitat destruction. The last rattle of a nonmigratory sandhill crane in Texas disappeared into the coastal fog over a century ago, echoed only by the contemporary calls of nonmigratory brethren clinging to existence in restricted ranges in Mississippi, Georgia, Florida, and Cuba. Luckily for present-day Texans, the migratory flock of sandhills stock the largest concentration of cranes on the planet! As long as we take pride in and protect these connubial avians and their cold weather-retreats, we will be graced with the lilting proclamations of cranes long into future and, perhaps, even be inspired with the spirit of romance that similar gruid concerts have stirred in people the world over.